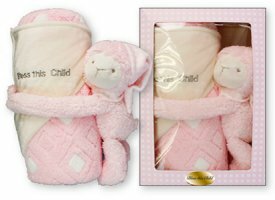 DIVINE CHRISTIAN GIFTS - Baby Plush Lamb with Blanket - God Bless This Child. Baby Plush Lamb with Blanket - God Bless This Child. Size: 75 cm x 100 cm in a gift box.